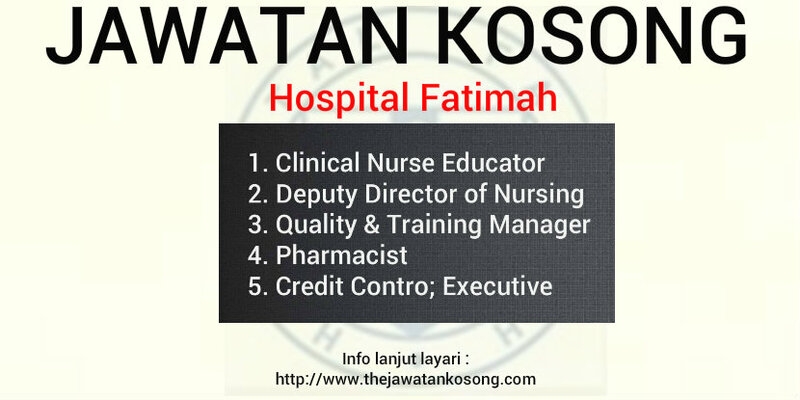 Hospital Fatimah kini sedang membuka jawatan kosong bagi mencari calon-calon yang berkelayakan bagi jawatan tersebut. Permohonan adalah dipelawa daripada warganegara Malaysia yang berumur tidak kurang daripada 18 tahun ke atas pada tarikh tutup iklan jawatan dan berkelayakan untuk mengisi kekosongan jawatan kosong tersebut. Sila tekan butang "APPLY NOW" untuk membuat permohonan secara online. The hospital is a 225 bedded specialist hospital located in a secondary business centre within a housing estate in Ipoh. Set in pleasant surroundings, it is one of several private hospitals in Ipoh. It provides inpatient and outpatient hospital services in the major disciplines to the people of the city and the surrounding areas. The medical staff comprise 34 full time resident consultants and 59 visiting consultants providing services in 16 clinical specialties and sub-specialties. Inpatient care is organised into nine wards and a critical care unit. The hospital was founded in 1974. Initially managed by members of the founding organisation (the Congregation of the Brothers of Mercy, a Roman Catholic Institute of Brothers founded in Trier, Germany), it was corporatised in 1984 and now has lay representation on the Board of Directors and its operational management is now by lay professional staff.